Wetlands are a significant part of Wisconsin. They provide habitats for fish and wildlife, retain storm water, offer recreation and serve as purifiers for lakes, rivers and groundwater. In Wisconsin, there are about five million acres of wetlands, which comprise 15% of the state. When a landowner or business decides to develop a property, it must be determined whether that activity could impact wetlands. Currently, impacts to wetlands are subject to a complex set of regulations, making it difficult for permit applicants to navigate the process – often costing the applicant tens of thousands of dollars and months of lost time in order to comply. AB 547 is a bill I have been working on with Assembly Majority Leader Steineke since the beginning of last year after hearing about difficulties developers and farmers were having in my district and throughout the state. It’s important to note that in Wisconsin there are federal and nonfederal wetlands. The vast majority of wetlands are adjacent to navigable waters, which fall under federal jurisdiction and are not affected by this legislation. This bill seeks to address difficulties that arise with non-navigable, isolated, intrastate wetlands. These nonfederal wetlands make up about 20% of Wisconsin’s wetlands, and this bill will affect up to 4% of them. It’s our goal to strike a proper balance between economic forces and our environment by streamlining the permitting process for isolated, nonfederal wetlands; addressing artificial wetlands; and creating a wetlands study council within the DNR. Prior to this bill, with the delineation process, if developers found they had acres of wetland to mitigate, often times they would walk away from the project because it was cost prohibitive – contributing to urban sprawl and destroying greenspace around our cities and villages. We are incentivizing development in urbanized areas. Incorporated areas that are serviced by sewer and sanitary districts with storm water management systems will now have a streamlined permitting process for any isolated, nonfederal wetlands. Artificial wetlands, which are created as a result of human modifications to the landscape and for which there is no prior wetland or stream history or significant functional value or use, are currently exempt from wetland regulations in some cases. This bill exempts them entirely, which has received widespread support. This bill establishes a mitigation grant program so that money being held by the DNR for the in lieu fee program will be used in a timely manner. The DNR will be able to appropriate that money to nonprofit organizations, specifically to create, restore and enhance wetlands in our state. So the 96% of wetlands in our state that are not affected by this bill will be restored and enhanced to an even higher quality. A wetlands study council within the DNR will be created which will provide recommendations on future wetland policy. The council will comprise of a wide variety of people across Wisconsin to ensure a comprehensive approach. Bringing stakeholders together is key, and a diverse set of viewpoints should help direct and identify hurdles in wetland regulations. Finally, the bill authorizes the DNR to seek federal wetlands permitting authority if EPA delegates it to the state. Current federal law allows a state to apply to EPA to make this request, and we believe that exploring this option could create more regulatory certainty. Wetlands are significant to Wisconsin and the reforms in the new law will not only help curb urban sprawl around our communities, but also enhance the vast majority of wetlands in Wisconsin for generations to come. 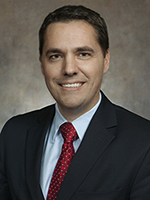 Senator Roth represents Wisconsin’s 19th Senate District, which includes the cities of Appleton, Menasha, and Neenah, as well as the Village of Winneconne. He currently serves as the Senate President.